Everyone has a friend or loved one struggling through a challenge of some sort or another. Everyone also has a time he or she faces struggles and sadness themselves. Whatever the case may be, Hope In A Box can provide support and inspiration and serve as a reminder to those in crisis that God is with them through the suffering. The key is to Hang On Pray Everyday. Hope In A Box is a creation of Romans 12 LLC, a Christian family business "focused on spreading H.O.P.E. (Hang On Pray Everyday)." 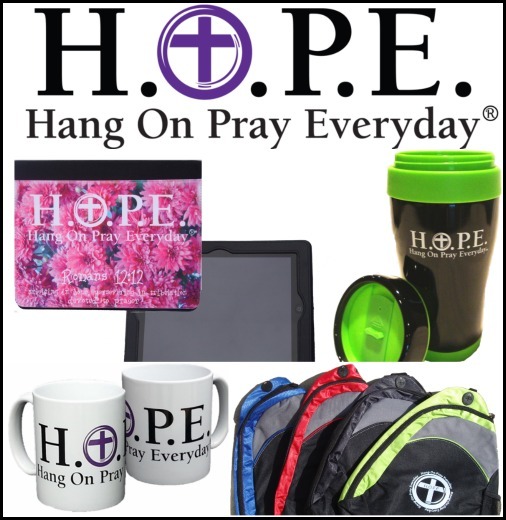 The unique products and gift boxes help encourage a struggling someone special (including oneself) stay strong in faith or find faith that has been lost or misplaced. Inside was a T-shirt, one-inch silicone wrist band marked "Hang On Pray Everyday," a bookmark, and literature highlighting additional H.O.P.E. products. The tag on the shirt says, "when life is challenging... when life is difficult... or when life just happens... H.O.P.E. The shirt is a Hanes Comfort Blend shirt (50 percent cotton and 50 percent polyester), so it's comfy and easy to care for. The wristband is pretty sturdy, too. The one-inch band is nice, but I think any I order in the future will be the half-inch size as those are a tad more subtle. Not only do products from www.hopeinabox.com inspire the recipient of the gifts, but it spreads H.O.P.E. to others, too, as 25 percent of all profits go to life, marriage, and family affirming ministries (info on the website). 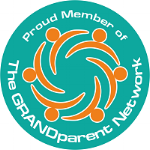 Prices on products vary, but Grandma's Briefs readers can use the code stressfree20 for 20 percent off orders from www.hopeinabox.com now through October 15, 2015.